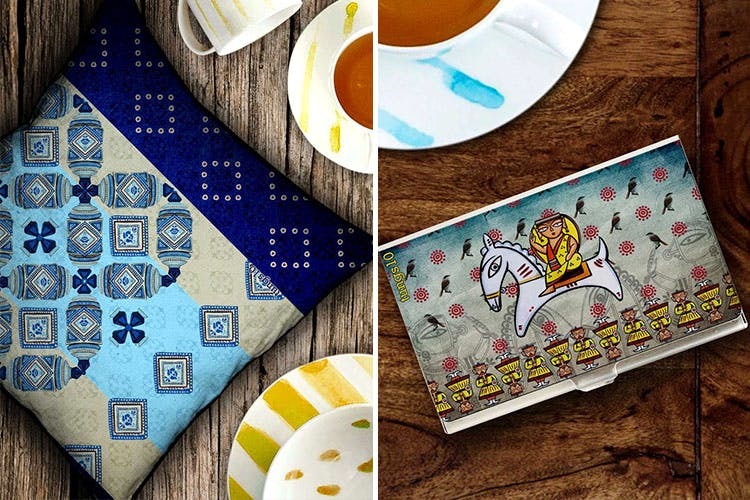 Tungs10 is a Delhi-based website that sells artsy accessories and home decor items with motifs that took us back to our childhood days’ favourite storybook – Panchtantra. With funky patterns like that of damru, cows, birds and rural Indian women, they’re bringing something creative to the table while paying a tribute to our rich Indian culture. They also deliver across India, so go ahead and add to cart. Wheee! If you keep losing all your business cards and think that storing them in your wallet seems tacky, check out Tungs10’s range of card holders with unique colourful patterns. Who knew birds and caricatured aunty patterns could look so trendy on card holders? We particularly love the lady warrior card holder and would like to think of it as a reminder to bring our warrior-game to work everyday. We believe that dining tables shouldn’t be dull spaces and Tungs10’s fun raja-rani in Paris coasters, elephant motif trays and temple dancer print table mats can brighten the most boring of dining tables. They also have mugs in bold digital prints and we’re pretty sure that downing vodka in shot glasses with desi artwork would be nothing shot of fun. We’re totally crushing on the clocks with motifs of rural Indian women and damru prints that we’ve never seen anywhere. Tungs10 also has the most unusually cool fusion cushion covers of Jim Morrison, Michael Jackson, telephones and royal Mughal kings. For once, a brand has gotten us obsessing over its home decor and accessories that are not our usual favourite black and whites.